There are so many different methods of how to curl your hair overnight, naturally, without using any heat! Shower and wash your hair, apply any styling products that you want, then start by using damp hair and pick one of these methods below. Each method delivers different results so don’t be afraid to try them all. Braids are great because they are easy and virtually fool proof. Try sectioning off your hair into three or four big sections then braid each section. You can do a french braid, french twist, herringbone braid, or any other braid. Now, the results you will get with braids might be more on the wavy side than curly. To get tighter curls/waves, braid off smaller/more sections of your hair. To achieve tight pin curls when you wake up in the morning, you will need bobby pins. Simply grab a small section of hair and twist it on top of your head, almost as if you are making a mini loose bun. You might find this easier to do if you wrap the hair around your index finger first and then lay flat the swirled hair on your head. Once you are pressing the swirled section on top of you head, secure it with a bobby pin. Repeat this until all your hair is pinned up. This is my favorite method for easy, quick, beautiful curls. I personally use a wide ribbon and tie it around my head instead of a headband because headbands can sometimes leave a red mark across your forehead for a little while after you take it off. Start by wearing a headband around your head, Boho style (where the top goes across your forehead instead of your hair), instead of how you would normally wear it. Next, grab a small section of hair from one side of your face and tuck it into the headband, then pull it down so that you are wrapping the headband with your hair.Repeat this, adding more hair each time, until you reach the back of your head. Once you reach the back of your head, you will start on the other side of your face in the same manner. When both sides are done and you have hair down the back of your head, tuck that hair into the headband until you have no more hair sticking out. You can use bobby pins to secure it if you feel like it is loose. Visit SoCalCurls on Etsy to view handmade hair ties specifically made for the headband curls method. 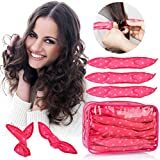 Get small strips of fabric or paper bags (about 1″ wide and a few inches in length) and lay a section of hair flat on one strip, near the bottom of the section of hair. Pull one side of the strip across the hair and then the other, creating an X over the section of hair. Then roll your hair up and tie the ends of the strip together at the top. Repeat this until all your hair is rolled up. This method will produce very tight curls. If you have a hair donut or have a homemade sock donut, creating beautiful curls is as simple as sleeping in your bun. Start by gathering your hair into a high ponytail, secured with an elastic bun. Next, grab your donut and roll your hair into a bun using the roll down method. Rolling your hair into the donut instead of around it produces curls instead of making your hair look like a giant curly wave, like it would if you roll your hair around the bun. Your no-heat alternative to heated rollers. Roll a section of hair up and fold the ends over the top when you are done to secure your hair. Repeat until your have rolled up all of your hair. 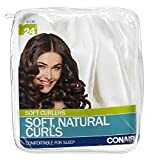 These pillow soft rollers are not the traditional big bulky ones and are comfortable enough to sleep in. There are many different ways to curl your hair without heat, and each method will produce different results. Have fun playing around with different options until you find your favorite! Keep your hair strong and healthy by ditching the heat tools and curling your hair overnight while you sleep.